Roulette is a popular and simple game that is available at nearly all online casinos. Unfortunately roulette rarely counts towards wagering with cashable bonuses because it is possible to simultaneously bet on winning and losing outcomes, greatly reducing variance. Red/Black, Odd/Even, 1-18/19-36 (18 numbers) -- Pays 1:1 (returns 2x Bet). 0 and 00 are neither even or odd for the purposes of this bet. 0/1/2, 0/2/3 -- Pays 11:1 (returns 12x Bet). This bet is only available in single-zero roulette. 0/1/2/3 -- Pays 8:1 (returns 9x Bet). This bet is only available in single-zero roulette. 0/00/1/2/3 -- Pays 6:1 (returns 7x Bet). This bet is only available in double-zero roulette and has a higher house edge than other bets. Roulette with "La Partage" Rule -- If the ball lands on zero, half of bets on 1-18/19-36, red/black, and even/odd are returned. For example, if you bet $100 on red, and the ball lands on zero, then you would receive $50. With single zero roulette and the "La Partage", the house edge is 0.5*1/37 = 1.35%. This combination is available with Microgaming French Roulette, Boss Media French Roulette, Cryptologic European VIP Roulette, Wagerworks, Chartwell, and Kismet. Cryptologic also offers double zero roulette with the "La Partage" rule. Roulette with "En Prison" Rule -- The "En Prison" rule is a variation of the "La Partage" rule. If the ball lands on zero, you have the choice to surrender half of your bet, or spin again. Surrendering half of your bet has the same outcome as the "La Partage" rule. If you choose to spin again, your full bet will be returned if your bet wins. Both choices have the same house edge -- 0.5*1/37 = 1.35% under Grand Virtual French Roulette rules. The only software I am aware of that offers this rule variation is Grand Virtual. Betfair Zero Lounge Roulette -- Betfair offers a roulette game with no zero, resulting in a house edge of 0%. Playtech Mini Roulette -- Playtech offers a roulette game with 12 numbers and 1 zero, resulting in a house edge of 1/13 = 7.69%. Microgaming Roulette Royal -- Microgaming Roulette Royal has a mandatory $1 side bet, which pays if the wheel lands on the same number at least twice in a row. If the same number hits five times in a row, the player wins the progressive jackpot. The house edge of the side bet depends on the size of the progressive jackpot. Historically, the jackpot has ranged from $6k to $660k, resulting in a house edge of 6 to 37%. The jackpot would need to reach ~$780k for the player to have an edge on the side bet. Kismet Bonus Roulette -- Kismet Bonus Roulette gives a bonus if red lands 5 times in a row. The bonus size is the lowest of the five previous bets. The house edge per spin is 2/38 - (18/38)^5 = 2.88%. Wagerworks Hot Streak Roulette -- Wagerworks Hot Streak roulette offers an optional side bet, which pays increasing amounts each time the selected group of numbers of hit. The house edge of this side bet is 9.04%. Like most side bets, the main game bet has a lower house -- 1.35% on 1:1 bets and 2.70% on other bets. A summary of payouts and the corresponding house edge is below. Betfair offers a roulette wheel with no zeros, resulting in a house edge of 0%. 5Dimes offers an improved paytable in their bonus casino. Microgaming French Roulette, Boss Media French Roulette, Cryptologic European VIP Roulette, Wagerworks, Chartwell, Grand Virtual French Roulette, and Gale Wind offer single zero roulette with the "La Partage" or "En Prison" rules, resulting in a house edge of 1.35% on 1:1 pay bets. 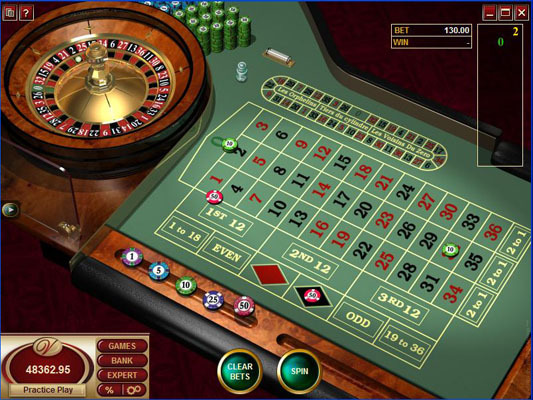 Net Ent offers a game called "French Roulette" which has the usual 2.70% house edge. There is no optimal strategy to roulette. All strategies have the same house edge in American and European roulette. If we assume the outcome of the spin is random, then all of the many roulette betting systems will fail over time. The one aspect of return that can be controlled is variance. Larger bets and numbered bets have a high variance. Small outside bets have a low variance. One can create a bet with zero variance by betting all 37/38 numbers, or by betting 18 red / 18 black / 1 zero (European Roulette). Roulette rarely counts towards wagering with cashable and sticky bonuses because of this possible "riskless" bet. The standard deviation per spin of various bets in single-zero roulette is listed below. See the return & variance calculator for expected range of return and bet size decisions. Red/Black, Odd/Even, 1-18/19-36 (18 numbers) -- 1.00 for European, 0.99 for French Roulette with the "La Partage" rule. This is roughly the same as a coin flip. Copyright © 2014 www.beatingbonuses.com All Rights Reserved.